Size: 5.5" x 3.0" x 1.7"
This calculator sold by Longines Symphonette could be easily recognized as a Texas Instruments Datamath calculator. 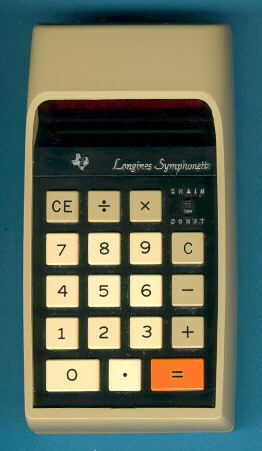 The only difference between the original and the badged calculators is the Longines Symphonette label. Datamath™ is a trademark of Texas Instruments. © Joerg Woerner, September 19, 2002. No reprints without written permission.